On a typical school morning in my house, in between their schoolwork, my children engage in any number of activities that don’t look much like “real” school. Maybe your homeschool functions a lot like ours, with lots of white space built naturally into your day – but, like me, you have to keep reminding yourself that shorter school days and more free time really are okay. Maybe you feel the burden of your own or others’ expectations, or the ghosts of your past experiences with traditional schooling. Or maybe you feel hemmed in by your state’s requirements for paperwork, standardized state tests, or X number of school days/X numbers of hours. Or maybe you struggle with deciding how those hours and days should be filled. There’s a whole lotta wasted time in traditional classrooms. Taking attendance and lunch count, responding to parental correspondence, practicing things like fire drills and emergency dismissal procedures…this takes time. Waiting for all students to take out their books and supplies, to be prepared for a lesson, to put away their materials…this takes time. Learning classroom routines like lining up, procedures for doing centers or group work, how to go in and out of the classroom for lunch, recess, and extra classes…all of these things take time. In fact, much time is lost in the traditional classroom just learning how to do routines, not to mention waiting for all the students to follow them. By its very nature, a homeschooling day is going to be shorter than a school day in a traditional classroom. The routine is usually far more efficient and has less administrative requirements, and the teacher-to-student ratio is much smaller. There isn’t going to be that wasted time doing school-specific routines or waiting for a large group to do things in unison. So instead of looking at free time in our homeschool days as something to be filled up just because we “should,” let’s look at it for what it is: a gift. There are extra interruptions and delays in the traditional classroom due to the volume of students. Even in the most highly ordered classroom, there are a plethora of interruptions. The child who can’t find ___ for the lesson. The child who has been absent for several days and now has to be caught up to be able to keep up with the rest of the class. The ever-constant need to sharpen pencils. A child that has a dentist appointment that afternoon and who needs all of their remaining classwork and homework put together at a moment’s notice. Children being pulled out for speech therapy or remedial reading who need to be caught back up to the rest of the class once they return. A squabble at recess that needs to be addressed immediately. These constant interruptions and delays chip away at authentic learning time. Interruptions, demands, and time constraints that cause teachers to be unable to meet all of their students’ academic needs effectively are frustrating no matter the setting. As homeschooling parents, we often feel pulled in many different directions, too - trying to balance home and school, to teach multi-ages at the same time, and to meet the needs of all our children, who often vary greatly in age and abilities. 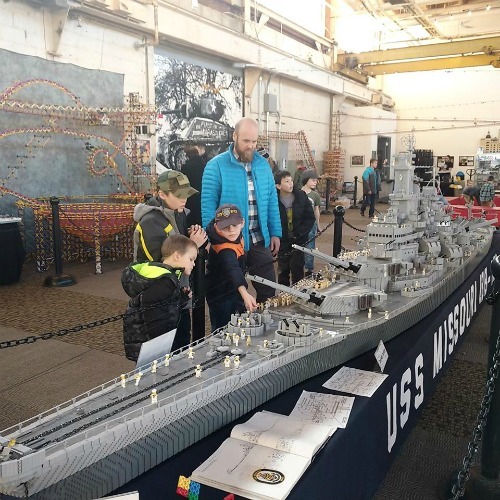 But when children have to wait – for their turn, for help, or for the next activity – that time is much better spent in play or pursuing a hobby or interest than sitting confined to a desk in the classroom. Hours spent in a classroom do not automatically equate to hours learning. Yes, the standard school day is six hours. But every single minute of every single one of those hours is not being spent learning. And I’m not talking about recess and lunch or all of the wasted time described above. The actual learning time is also less. Any time students are learning in a large group, there is always a group of kids who are advanced learners - the ones who don’t need the slow pace or the lengthy time spent on topics. These children are held back from being challenged and reaching their fullest potential. At the opposite end, there are children who really struggle to learn. These are the kids who are failed by being rushed and moved along to the next topic (and later, to the next grade level) even when they have mastered nothing. And let’s not peg children into categories. At any given time, any child might really excel at a given topic…or might really struggle. And what happens when students are not engaged in the lesson? They daydream, mess around, worry, shut down, or just plain do something else. The trouble with whole-group instruction is that it is next to impossible to effectively and meaningfully reach everyone’s level at once. And if students are regularly sitting through lessons that are too easy, or redundant, or too difficult, are they engaged and actually learning? Nope. Teaching one child, or even a group of siblings, does not take as long as it takes to teach a classroom of children. Moving at the pace appropriate for our children, being able to work 1:1 to ensure a child is engaged, reviewing only what needs to be reviewed, and pushing on ahead when a child is ready to are all benefits of learning at home. 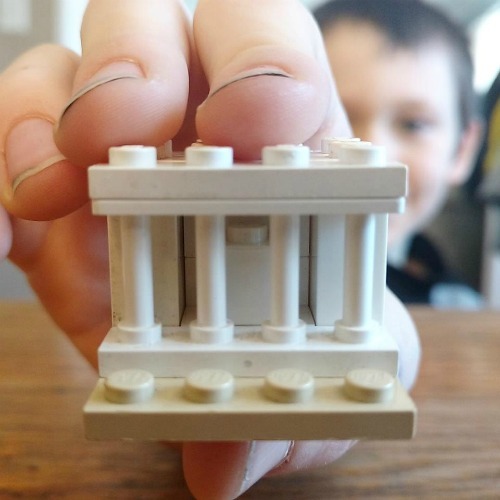 A short lesson of 20-30 minutes of fully engaged instruction, especially instruction specifically tailored to the needs and abilities of the child being taught, is always going to be more meaningful and effective than a lesson twice as long where there is intermittent or no engagement at all. The answer to different abilities in the school setting is to offer customized and individualized instruction. A child who has anything at all atypical about them AND who is fortunate enough to be correctly diagnosed AND who is fortunate enough to be in a school setting that has the resources to provide extra services, receives an IEP. Whether it is giftedness, or a special need/disability, or a mental illness, or a behavioral issue, or allergies, or the need for speech therapy or remediation…whatever the difference is, it is addressed in an IEP, or Individualized Education Plan. The child’s needs are diagnosed and responded to with accommodations written into their own unique learning plan. As homeschoolers, we provide an individualized education plan method for all of our children even if we don’t give it a special acronym. Our methods of instruction, the curriculum, and the pacing of our lessons are intentionally chosen with our children’s needs and abilities in mind. Homeschooling allows for teaching and learning outside of the one-size-fits-all model. That individualized approach often creates a more optimal learning environment - one that is much more efficient and that breaks the conventions of what “school” should look like. Not all classrooms and schools fit the same mold. When we think of “school,” most of us think of traditional-style public or private schools. But within every state, there are unique school settings. Montessori, Waldorf, Charlotte Mason, independent/free, charter, and even some private schools all have different values and their own way of doing things. There are schools within every state that do not follow Common Core and do not do standardized state testing. There are schools that have substantial hours allotted for nature study, gardening, life skills, play time, the arts, athletics, and more. Not all homeschools are the same. Even if a state has very specific homeschooling requirements for testing, number of hours, or number of days, it’s good to remember that how our “school time” is filled does not have to look exactly the way it does in a traditional school - and to remember that there are plenty of “brick and mortar schools” that are doing things their own way, too. 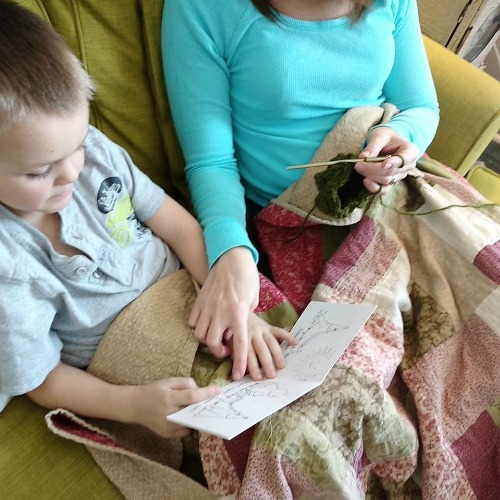 Homeschooling is learning at home, but it doesn’t always have to look like school at home. If our lessons and our school days are much shorter or look quite different from “real school,” let’s embrace that time and freedom. Sound the trumpets! Cue the confetti! 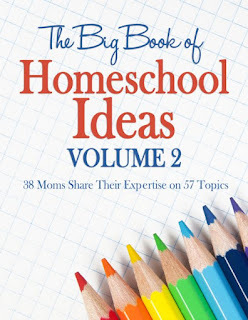 I've joined forces with 37 other homeschool moms to write the second volume of The Big Book of Homeschool Ideas. 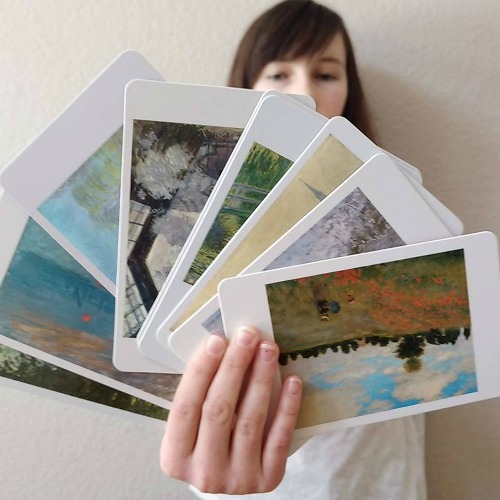 Need ideas for getting Dad or grandparents involved? What should you do if you have anti-homeschool family members? Need help creating socialization opportunities for your homeschooled teen? Are you confused about how to assign high school credit for courses and electives? Would you like to make back to school time special for your kids? Are you a city-dweller who longs to go outside for nature studies? Need ideas for raising tomorrow’s thought leaders and entrepreneurs? Do you have a child who is a chronic worrier? This is the book for you. I happened to contribute my thoughts on using living literature as a core curriculum. In my chapter, I share the WHAT, WHY, and HOW of teaching with living books as well as provide some links and info to some of the top living book curriculums. The entire eBook is currently only $3.99, so grab your copy today! In the UK, we use the term home education. 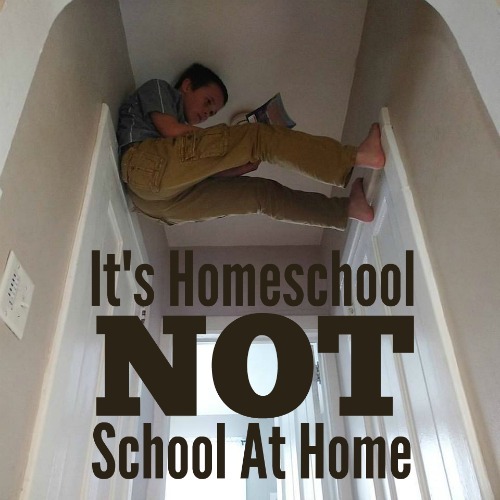 Many home educators frown on describing ourselves as homeschooling as we want to differentiate from school at home. Education doesn't have to have anything to do with school! I love this! I've never thought about the difference in the two phrases, but you're right. Home education does sound more like what we're after! Thanks for pointing that out, Sarah. This post is fantastic and so reassuring. It makes me feel better about not worrying that our 4 hours required to make a school day always be filled with books or other specifically planned activities. Also, is the picture in the middle with the numbers and translucent discs a game? If so, what is it? I've got several math-oriented kiddos and I think they might enjoy it. Thanks! It's called Tic-Tac-To Dice. 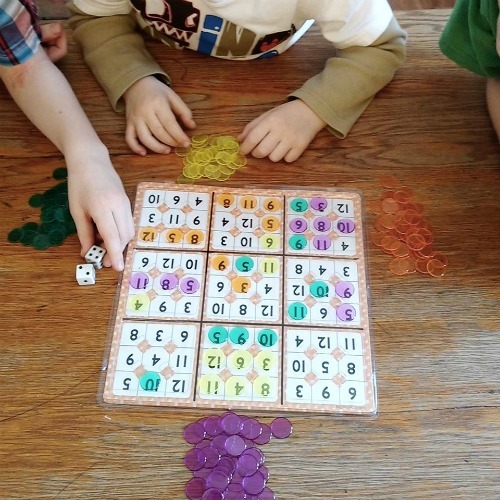 It's a great addition game that can be slightly tweaked for other math processes. Yes homeschool sounds great for the many parents that can afford to quit their job and be a stay at home parent. Or how about the kids that aren't socially developed when they go off to college and then get home sick because they've never been on their own. I've been to 3rd world countries where kid thrive so well with school it's crazy. Kids there want to be educated and a lot of the are really brilliant but just don't have the money to go any further than high school. We are so catered here in America that we don't know what struggle truly means. But to get back on topic, I think the majority of children should have an opportunity to be in school and if they can't thrive in school then you home school them or should I say CATER to them some more. I'm sure you'll get plenty of responses so I'll just speak for myself when I say that it's pretty unfair for you to judge me and make assumptions about my situation. First, I homeschool AND work. How do I do that? Well, my husband and I are partners and we work it out. Beyond that is none of your business. Second, your point about kids never being on their own is mute because public school kids are certainly never on their own. Third, I don't consider my parenting style to be "catering". I consider it to be raising my children instead of allowing a whole bunch of strangers to do it for me. I don't judge others that don't homeschool, though. We have plenty of friends that send their kids to public school. We all get along fine and dandy. Why? Because we are decent and mature people that respect each other's differences and don't judge. Nope. You don't have any idea what you are talking about as you make your sweeping generalizations. My family makes huge sacrifices for me to be able to stay home with my children. It's not some privilege, we worked hard for it and sacrificed. We live in a dumpy, too small apartment. We eat every meal at home because we can't afford to eat out. I have to strictly budget and decide who needs what the most. I have 2 college degrees. I could be bringing in a significant income for my family and we could live somewhere nicer. But I'd rather make those sacrifices and raise my children my way. I love this! Thank you for writing it out so well. I'm going to share it on my blog (with the link back here, of course). God Bless you for writing your wonderful post. This is a reassuring reminder for me to "relax" from the school at home mindset and facilitate learning through our daily activities.